Industrial Brush Dampening brushes play an important role within the inner workings of a web offset printing press. They are also used as applicators in paper, steel, and textile mills where uniform coverage on moving webs can not be compromised. These "High Tech" precision brushes have become the tool of choice as web speeds continue to increase and quality becomes more critical. Each brush core is manufactured using stainless steel components to combat the effects of corrosion. The cores are dynamically balanced at operational speeds to ensure vibration-less performance. 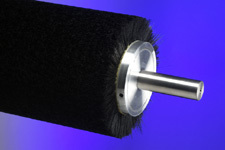 Also available for even higher critical speeds, we offer the high speed dampening brush core in a light weight carbon fiber construction. Our patented "Fineset" cylinder brushes are extremely uniform, presenting individual strands of bristle rather than clumps or tufts. The brush density is controlled, during the manufacturing process, by a metering device which allows unlimited bristle patterns ranging from open to extremely dense. In most dampening applications, a select brush density, "medium open", has been our best performer. The density allows each individual bristle to respond unhindered by the surrounding filaments and rejects most contaminants including paper dust, gum, and ink while it eliminates water spotting and washed out areas. The dampening illustrations provided here are made available to better understand the two most popular forms of brush dampening. The illustration for your application, large or small droplets, complete saturation, or a fine mist is possible with one of these configurations. 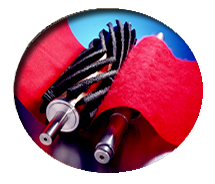 If you presently have a brush dampening system and need a replacement brush, please feel free to contact us for a competitive quotation. Our Replacement and Re-bristled brushes are guaranteed to perform. We encourage you to contact us with your particular application, and let us help you determine the brush and configuration that best fits your application.